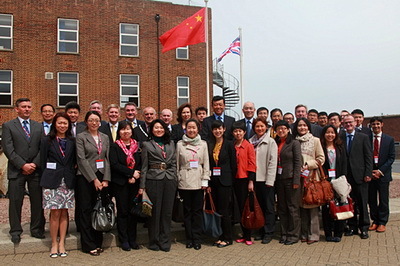 On the bright beautiful spring day of May 16, 2013, with calm winds and tranquil seas, Ambassador Liu and his wife headed portion of the young diplomats from the Chinese Embassy on a visit and inspection of the Port of Felixstowe. During their visit there, they obtained an in-depth understanding of the development situation of the port and the role it has played in the economic and trade links of China and the UK. As they entered the port, Ambassador Liu and his party were warmly welcomed by the parliamentary chief of the Suffolk coastal region, Ray Herring, Deputy Mayor of Felixstowe City, Graham Newman, the controlling shareholder of the port—Hutchison Port Company general manager in Europe Zheng Zhenxun, COSCON British firm general manager Fang Liang and the senior management of the port. To start with, Ambassador Liu and his party listened to the port staff’s introduction about the development situation of the port and watched the related video. The Port of Felixstowe is located in Suffolk of Eastern England. It is 90 miles away from London and is the largest and busiest container deep-water port in the UK. The port is wholly-owned by the Hong Kong-based Hutchison Port Holdings Company. The General manager, Zheng Zhenxun, who has been in charge of the port operation for many years, introduced to Ambassador Liu and the young diplomats that there are more than 4000 ship handlings every year with an annual throughput as many as 3.4 million teus, ranking it the 6th in Europe and 36th in the world. 40% of the import and export goods all around the UK are gathered and distributed through that port. After that, Ambassador Liu and the young diplomats took a tour of the different parts of the port. 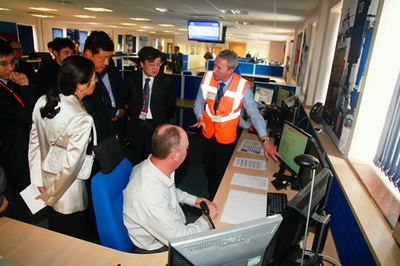 They first came to the central control room, where they watched with great interest how the staff used the computer and video monitoring system to regulate the ship in carrying out stevedoring operations. Through the computer, the staff members of the central control room directed the shore crane workers about a mile away in the sorting, lifting and packing of the containers ashore one by one accurately among tens of thousands of containers on the deck, while at the same updating in real time the container stacking data on the screen. The young diplomats were deeply impressed by the highly informatization and automation of the port’s operation. At the central station, Ambassador Liu and the young diplomats watched the containers being placed on a freight train one by one and completely made ready for shipping, while listening to the staff introducing the importance of railway transport to the port. There are two freight railway stations in the Felixstowe Port in which more than 40 freight trains establish rapid logistics with London, Birmingham, Manchester, Liverpool and Glasgow every day. The port will open its third freight railway station in June of this year. Coming to the docks, the young diplomats excitedly noticed that almost all the new hoisting equipment was manufactured by Shanghai Zhenhua Heavy Industries. Everyone was proud for China’s large-scale machinery manufacturing enterprises’ success in occupying the international market. 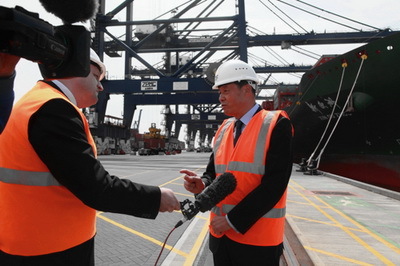 Ambassador Liu was interviewed by Independent Television News (ITN) in front of the “New European” ship of China Shipping Company while it reached the port, loaded and unloaded. Ambassador Liu spoke highly of the Port of Felixstowe for the important role it had played in the China-UK trade cooperation and said China is the second largest export market of the UK. In 2012, the bilateral trade volume amounted to USD 63.1 billion with an increase rate of 7.5%. The UK has not only become the sole country in the European Union which realized growth in both imports and exports to China last year, but also the one with the fastest export growth to China in EU. Its export amount to China has reached a record-breaking USD 16.8 billion with an increase rate of 15.5%. China-UK economic and trade situation had a good start in the first quarter this year, and the trade volume has risen by 6.5%, reaching up to USD 14.5 billion. 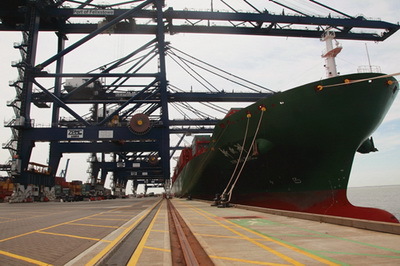 The Port of Felixstowe is the largest container port in the UK through which 60% of the import and export goods between China and the UK are gathered and distributed. The port has advanced facilities, efficient management and convenient logistics. It is the port of call for COSCON and China Shipping Company and serves as s a direct link in China-UK economic and trade exchanges. Ambassador Liu also congratulated the Port of Felixstowe on its recently being named as the “best container port of Europe” in the 27th AFSCA (Asian Freight and Supply Chain Award) and he hopes to see the prosperous development of this port in the future. After coming to the end of a compact and full scheduled day of visiting, Ambassador Liu and the young diplomats took group photos with the staff at the Port of Felixstowe and said goodbye. During their more than two hours return trip, the young diplomats excitedly shared with each other the knowledge they had gained regarding the shipping, port and logistics from the staff of the port. They all agreed that this visit had broadened their horizons and knowledge as diplomats, by which they had a direct understanding of the development of Chinese enterprises in the UK, deepened their understanding regarding China-UK economic and trade cooperation and further enhanced the awareness that diplomatic work is for domestic economic construction.